Lexus doubles its “F” performance line by bringing those trappings to the GS midsize sedan. The Lexus GS is a midsize luxury sedan and prior to this year no performance variant was offered. But two things were changed for 2016: a turbocharged four-cylinder 200t model was introduced and a high-performance GS F sedan was rolled out. Currently, the GS line consists of four-, six-, and eight-cylinder gasoline engine choices, effectively matching what some of its competitors offer, minus a diesel. Instead of a diesel, the GS line lays claim to a hybrid. And that should be hardly surprising as Lexus has more hybrid models than any other luxury brand. My test model for the week was the 2016 Lexus GS F, the second “F” product in the Lexus stable. Joining the RC F, both models share a normally aspirated 5.0-liter, V-8 engine making 467 horsepower and 389 foot-pounds of torque. 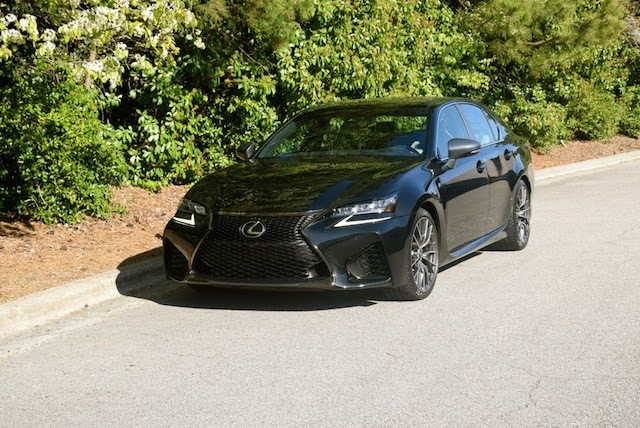 Paired with an 8-speed automatic transmission with paddle shifters and a manual mode, this powertrain combination enables the Lexus GS F to take on such praiseworthy competitors as the Audi S6, BMW M5, Cadillac CTS-V and Mercedes-Benz E63 AMG. Think “F” and “fast” may come to mind. F also represents Lexus’ high-performance brand, what has also yielded the limited-edition and exclusive LFA sports car. The line is a step above “F Sport,” a performance-oriented sub-brand big on looks, but lacking the consummate substance or execution of true F models. The 2016 Lexus GS F is formidable in two departments: looks and performance. As for its countenance, several unique to the line modifications are present. To begin, the now familiar hourglass (spindle) grille features a one-piece mesh spread with a narrow upper section and a much larger lower section. The headlamps offer a three-jewel design with L-shaped daytime running lights underneath. On both sides of the lower grille are oversized embrasures, covered with the same mesh layering. As for the hood, it flows into the front end and features creases and accents to complete this sedan’s muscular frontal presentation. From the sides, the GS F has a look of always being in motion or is ready to take off. A long, sweeping profile is accented with upper character lines as well as distinctive boomerang side vents aft the front wheels and connecting with the lower body sculpting. All models are outfitted with 19-inch, forged aluminum wheels set within Michelin Pilot Super Sport summer tires. The test model came with color-coordinated brake caliper covers — the available orange calipers would have been my choice. From the rear, the Lexus GS F presents a carbon fiber spoiler matching the sedan’s patina. Wrap around combination lamps with marque-familiar L-shaped LED lights, reflectors, and body sculpting are present. A quad exhaust rear diffuser provides the perfect exclamation point on this potent and sybaritic performance sedan. Inside, the indulgence continues with a cabin fit for five. No flat-bottomed steering wheel here — the GS F exudes speed and doesn’t need such a token embellishment. What is present are aluminum pedals, including a generously proportioned left foot rest pedal. Lexus spared nothing in dressing the interior in the finest materials. Carbon fiber elements are found here and there, including on the door trim, at the base of the remote touch interface, and on the center register. Spread across the top of the instrument panel, on the door trim, and covering the center console is Alcantara. Exquisite stitching, decorative rivets, and LED lighting illumination are among the other touches in view. Lexus describes the interior design as “driver-centric” and I’m in full agreement with that declaration. The cabin is substantial enough for all displays and controls to be sufficiently spaced — nothing is cluttered and every section is wisely used. I especially liked that the tachometer is the larger of the two analog dials and is centered in the display. To the right is a smaller speedometer display. To the left is a digital driver’s information center. It is a clean, attractive layout and one unlike any other I’ve found thus far. My favorite interior feature beyond a doubt was the color display. This massive 12.3 inch display sits within an alcove located near the top of the dashboard. Essentially, it is a two-part layout with the left three quarters showing navigation, media, and radio information. The right portion offers a map of the road ahead. The arrangement synchs with Lexus Enform, the brand’s telematic system. Working your way down the center stack a pair of vents hem in an analog clock, followed by a CD player with radio knobs present. Beneath that are an assortment of switches for managing climate control, seat heating and cooling, and the vents. The carbon-fibered section between the front seats include a covered compartment revealing a pair of cup holders. To the left and immediately between the seats is a transmission shifter and drive mode knob. To the right is an armrest and toggle knob for controlling the telematics display. Further, a sliding storage compartment with a removable tray, a pair of USB ports, an auxiliary audio input and a 12-volt outlet inside rounds out the center compartment. Smooth leather seating surfaces are found front and rear with high back, ergonomic sport seats up front. The seats were designed with comfort and support in mind with pronounced bolstering to support the hip and thighs. Some may find the seats a bit stiff for their tastes, but lumbar adjustment should rectify any complaints they may have. Three adults can sit in comfort side-by-side on the rear seat. Of course, two is better with the armrest pulled down from the center position to reveal a pair of cup holders and a storage compartment for a smart phone. A pass through grants access to the trunk and its 14 cubic feet of storage capacity. No spare tire is offered — if you have a flat, an electric pump takes care of that problem, except if a nail embeds in the sidewall. In that case you’ll have to call for assistance. And that is precisely what happened when the GS F was en route to my house — a nail was discovered in the sidewall and the tire had to be replaced. That replacement took several days to accomplish as a hard-to-find tire had to be ordered and delivered to the dealership. Fortunately, Johnson Lexus of Durham (NC) rose to the occasion and the sedan was delivered to my home four days later. So much for not having a spare! I am a fan of performance boosting, in an effort to squeeze more power out of an engine’s footprint. My boosting preference is a supercharger, but if twin turbocharging is used I’m usually good with the latter as lag is essentially negated. Engine experts and enthusiasts may prefer a single, large turbo, but I have found that lag is still present. Lexus could have taken the boosted circuit with its beefy V-8, but it opted for the normally aspirated route and that was a smart decision. Delivering 467 horsepower and 389 foot-pounds of torque, the 5.0-liter V-8’s performance numbers are well-suited to this sedan. In any case, power is just one of three essential ingredients found in the GS F — the other two are style and handling. All three make the Lexus GS F what it is — a compelling alternative to Europe’s finest performance sedans. At the heart of the GS is its driving dynamics. In particular, the drive mode select control offering Normal, Eco, Sport S, and Sport S+ choices. While you may prefer to have the mode set to Normal or even to Eco to maximize fuel economy (a good idea as the sedan has a thirsty side), it is the two sport modes that unleashes the beast contained within. Choose Sport S and the acceleration quotient improves as engine output and throttling are modified. Choose Sport S+ if you want all that and improved communication through the steering wheel. Choose the latter and it feels like a pair of weights are hung on either side of the wheel. Also at work is a torque vectoring differential (TVD), what manages rear wheel torque and is especially welcome when cornering. Torque is sent to the appropriate rear wheel in a bid to help the driver maintain control and do so in confidence. A switch located on the center console controls the TVD, enhancing the drive during standard, slalom, and track driving conditions. Add in an already rigid body, a performance-tuned double wishbone front and multi-link rear suspension, Brembo brakes, and electric power steering, and you have one heck of a fun driving experience at the ready. That experience comes fast and furious, provided you have a place to “open her up” and let the GS F strut her stuff. Under normal and eco driving conditions, she purrs. Make the switch to Sport S and the GS F roars. So, let’s change the “F” to represent ferocious. Indeed, that roar comes by stomping the pedal and keeping your foot on it as the GS F continues to pick up speed. It feels as if you’re hitting the red line as the engine revs high and hard. The moment you take your foot off the pedal, the exhaust system shrieks like a banshee — one or two hollers later and the GS F calms down. Estimates of the GS F’s 0-to-60 mph comes in around 4.3 seconds. That seems about right. I allowed the transmission to do all the work as I wasn’t especially interested in flicking the manumatic stick to get the results I sought. Certainly, the Lexus is fast. But where it shines brightest is on the twisty roads. I set the “diff” to slalom and the driving model to Sport S+ and had at it. Cornering was a snap — more than once I tackled 90 degree turns going at least 40 mph without braking (I was driving in the country where visibility was excellent and traffic nonexistent). Shut down traction control and your anti-lock brakes won’t interfere — that button is on the lower lip of the dashboard and to the left of the steering column. Then, navigate the twisties and you’ll enjoy the Lexus GS F unimpeded. I don’t have a raft of luxury performance sedans to draw from to compare to the Lexus. Then again, various Americans sport coupes, the Corvette, Jaguar F-TYPE, Porsche Cayman and 911, Nissan GT-R, and BMW M6 have each been tested by yours truly. This Lexus is definitely a commendable model in its own right. Should you consider the Lexus GS F? Yes, if you have $85,390 to spare. It is a mono-spec model, although there are a few upgrades worth considering, including the aforementioned orange brake calipers ($300) and a Mark Levinson premium sound system ($1,380). Your best GS F alternatives come from Cadillac and the top European brands, but when it comes to measuring prestige, quality and reliability, it is simply too hard to easily beat Lexus. If you can live without the “F” the standard GS comes in at a very reasonable $50,000 and also offers optional all-wheel drive. For $45,615 you will enjoy even greater savings, provided you dispense with the standard and normally aspirated 3.5-liter, V-6 (GS 350) and go with the available 2.0-liter, turbocharged four-cylinder engine (GS 200t). Also, decorative F Sport trim on the GS 350 model adds just over $4,000 to the base price. In all, Lexus makes a strong case for its own line of performance models. Another candidate for all things “F” would be the IS sedan, a compact model that aligns with the current RC. Whatever plans Lexus has for future F development, the current two-prong approach is an effective strategy and is worthy of serious consideration by performance enthusiasts who give equal consideration to all things luxury. See Also — Chrysler 200C: The Last Hurrah? 2016 Lexus GS F photos copyright Auto Trends Magazine.